I was excited to read about the science of popularity and learn the secret behind why some things become massively popular. I'm still waiting. The Good: This book tells several interesting stories about hits (movies, music, books, etc.) and their journey from creation to worldwide sensation. I enjoyed those stories, most of which I had never heard. I also appreciate the variety of stories and the fact the author included examples from different centuries. The narrator does a very good job reading the text. His voice fit this type of book. His reading style also fit well. The Bad: This book uses the term "science" in the subtitle, but there is very little actual science, very few studies, very few experiments. Most of his evidence is expert opinion and a few studies that could be interpreted in many ways and need additional follow up studies to confirm the conclusions. The author also makes many assumptions that could easily be wrong; his conclusions need more testing and more rigorous studies to confirm them. I also didn't appreciate the author's sexist language. Overall, this book is good if you are just looking for stories of hits and their rise to prominence. 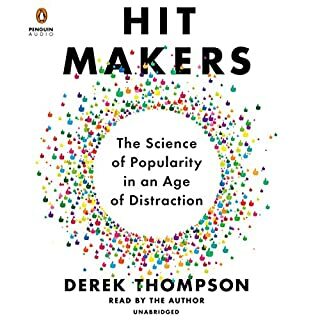 This book is disappointing if you are looking for the reason why hits became so successful and/or a formula to create or predict a hit yourself. 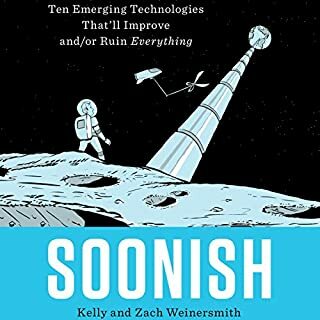 The idea of this book is really cool and unique--looking at the costs and practical concerns that affect whether new technologies will be successful in everyday implementation and why. The authors have spent a lot of time researching emerging technologies and point out the cost and practical engineering problems that must be overcome. Neither are actively involved in research or development of the technologies, so all their information is second hand and probably not as complete as it could be, but it still could make for an interesting read. If only they had stopped there. But no, the authors had to inject their poor sense of humor into the book. They are constantly injecting footnotes into book (when they really mean sidenotes), only half of which are relevant or interesting. They also try to make jokes that just aren't funny. And their delivery of the narration is very flat and expository which is a little boring to listen to. And I didn't appreciate the sexist language used throughout. Overall, this book had a great idea and great potential, but the bad jokes, poor narration, and not understanding the difference between a sidenote and a footnote yet inserting one in every 10-20 seconds took away from what could potentially be an excellent book. This book is called "Originals", but that is a misnomer. It has little to do with being original. It's really about Social Change and those who brought it about. 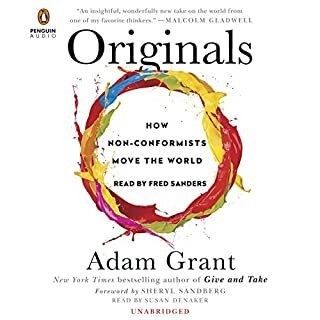 Adam Grant presents many case studies about both well-known and obscure cases where individuals and groups challenged the status quo and succeeded. The stories are very interesting and well told and come from a variety of times, places, and situations from social change to business change. I liked the case studies, how they were presented, and the variety of situations. I also thought the narrator did a great job capturing the voice of the book. The parts I didn't like are the explanations and conclusions. The author presents several studies and expert opinions to support his assertions, but more often than not he merely expressed his opinion to explain why something worked or didn't work. This lowered the quality of his conclusions. I also got tired of the author constantly goes back to Martin Luther King and the "I Have a Dream" speech over and over and over again. Mentioning it once would have been plenty. Overall I enjoyed this book and am glad I listened to it. I just wish the author had put more effort into supporting his conclusions instead of just expressing his opinion as fact and getting down to the real reasons and motivating factors. In 1956 a plane bearing mysterious cargo takes off from a small airport outside Los Angeles and disappears into a raging storm. Nearly 60 years later, while flying over the Sierra Nevada, retired military assassin turned civilian flight instructor and would-be Buddhist Cordell Logan catches a glint of sunlight on metal and spots what appears to be an aircraft wreckage. His life will never be the same. What a great story! It had me hooked from the beginning until the end. The plot was very tight with the twists and turns making sense without being obvious. The reader did an excellent job capturing the voice of the main character and the other other characters. I loved the sarcastic but intelligent outlook of the protagonist and his commentary on pretty much everything. The characters each were interesting and felt like actual people. I can't wait to read the next book in the series. 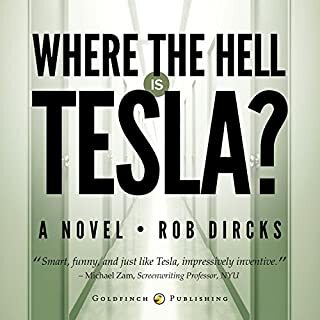 This is a speculative fiction story about an unproduced invention of Nicola Tesla. While this story has a pretty decent plot, the real charm is the way the story is told and the way the characters are developed. The writing is sharp, witty, funny, and sounds like a buddy telling you about a crazy adventure he just had. There is little science in the book and the twists and turns are nothing earth shattering, but the ride is so much fun you don't care about that because neither are the point of the story. The characters are fully fleshed out as real people who will probably remind you of someone you know. If you want a fun read with lots of clever, modern humor; this is the book for you. The language in this book is definitely for an older audience with curse words every 5 seconds, so if you aren't a fan of profanity, this isn't the book for you. If you have a fairly liberal mindset, you enjoy sexist language, and you just want your worldview reinforced, you'll enjoy this. If you are looking for insight, useful perspective, or specific ideas to help you improve in work and life then I'm afraid you'll find yourself disappointed. The stories are interesting but unrelated, and the author's explanation is over simplistic and lacks the research and logical rigor of other books I've read. If you just want an entertaining read about interesting true stories, you'll probably enjoy this. 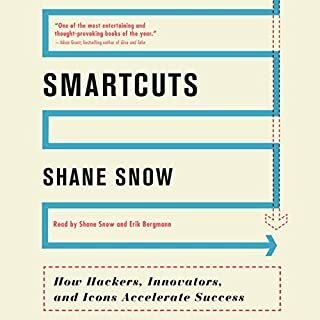 Has Smartcuts turned you off from other books in this genre? 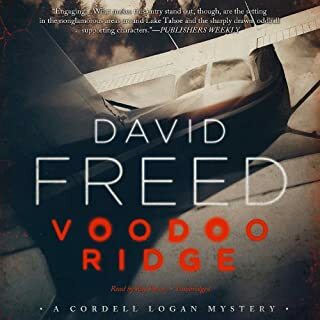 I will be more cautious in the future and probably read the Kindle sample before wasting another credit on a title that sounds interesting but is by an author I'm unfamiliar with or that wasn't strongly recommended by a trusted reader. The performance was very competent but nothing out of the ordinary. It fit the book and never got on my nerves. I read a lot of these types of books, and they are hit or miss. Some are excellent and I can't wait to recommend them to everyone else and put the things I've learned into practice. This wasn't one of those. It felt like someone had read the books I have read, loved them, and wanted to write one himself but lacked the insight to do so. It was entertaining, but not as educational as I've come to expect. And I was put off by the sexist language.